Blamed took the G3 Comely at Aqueduct. Photo by Joe Labozzetta, NYRA. Cleber Massey’s Blamed emphatically answered the question of handling the increased distance when she raced to the front, extended her lead coming out of the final turn and outkicked a charging Remedy in deep stretch to post a gate-to-wire three-quarter length victory in the 69th running of the Grade 3, $200,000 Comely for 3-year-old fillies on Friday at Aqueduct Racetrack. Jockey Julien Leparoux guided the daughter of Blame to the front, where she paced the eight-horse field through an opening quarter-mile in 24.96 seconds and the half in 49.01 on the fast main track. Out of the far turn, Blamed opened a 4 1/2-length lead, going three-quarters in 1:13.14. 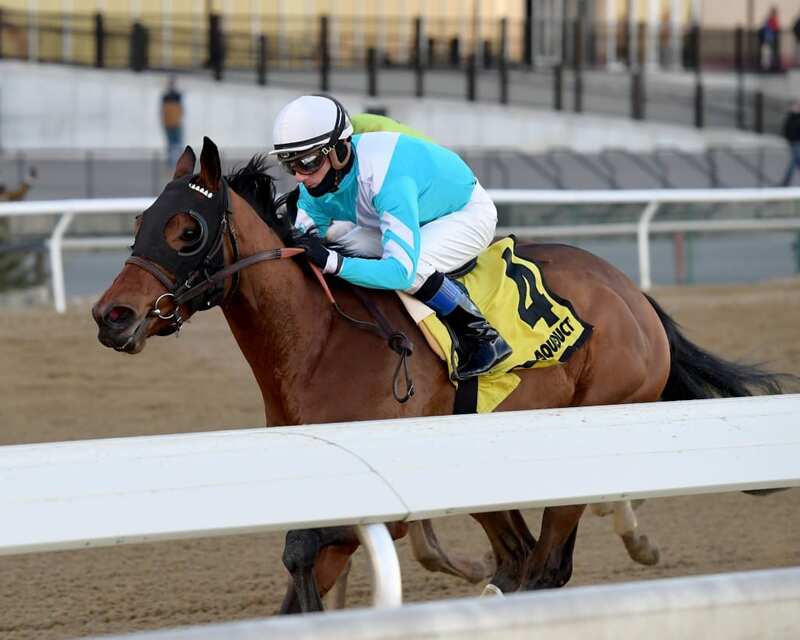 Remedy, under Hall of Fame jockey Javier Castellano, rallied in the final furlong but fell short as Blamed completed 1 1/8 miles in a final time of 1:51.98 to notch her sixth win in eight starts. Blamed, the 6-5 favorite who returned $4.40 on a $2 win bet, had won previously going around two turns at Sunland Park in the 1 1/16-mile Sunland Park Oaks on March 25, the last of five consecutive wins she earned for Joel Marr before Hall of Famer Bill Mott took over the training duties before a runner-up effort in the seven-furlong Grade 2 Raven Run on October 20 at Keeneland. “I watched her break well,” Mott said. “I didn’t see what happened with the other speed horse in there [Remedy] outside at the break. I saw she [Remedy] was further back and it looked like we were going relatively easy on the front end. Of course, you never know going a mile and an eighth for the first time in her life. She got the job done. Blamed, a daughter of Blame out of the winning Giant’s Causeway mare Salsa Star, was bred in Maryland by Sagamore Farm. Remedy, who was also second in her stakes debut in the Grade 3 Remington Park Oaks on September 30, registered her second straight runner-up effort for trainer Brad Cox, finishing 10 lengths ahead of the Jeremiah Englehart-trained Indy Union. Split Time, Hey Niki, Stronger Than Ever, Alberobello and War Cabinet completed the order of finish.